A beautiful and soft hand knitted cowl can keep you warm all winter. Boho and fun this chunky triangle cowl is cozy and stylish. 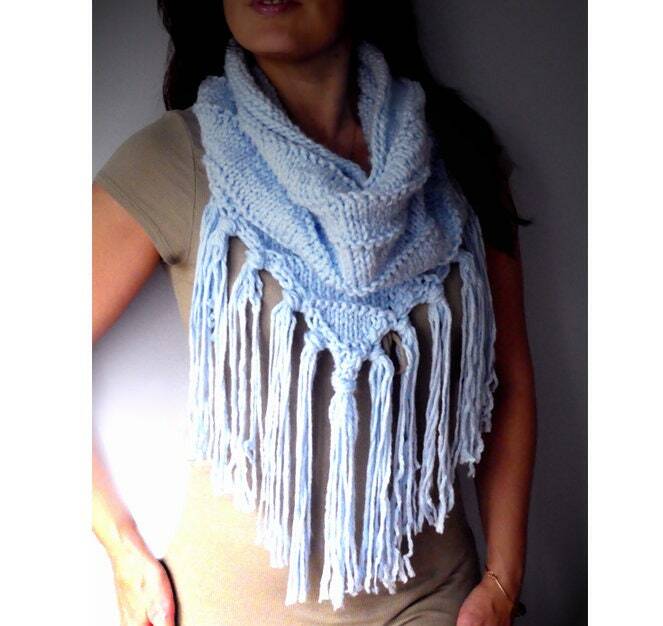 It is made in baby blue color with fun fringes and ready to accessorize your outfits. The scarf is closed in the back, just ready throw over your neck. Hand or delicate machine washable. Nice Aquamarine crystal(s) pendant! Quick Shipping! Great Packaging! Thank You! 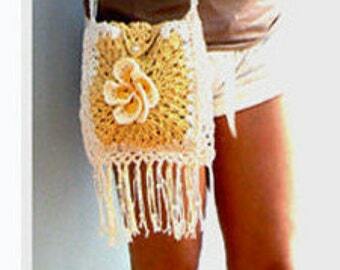 I accept payments through credit cards, Paypal and also Etsy gift cards. If you want to pay with paypal click direct checkout and then choose paypal option. I guaranteed my products of high quality with great style. If this fails to meet your expectations and you are not completely satisfied with my products please contact me and see if we can work something out. JEWELRY are final ,no refund or exchanges. The crochet swimsuits. coverup skirts and custom orders and art paintings are final, no refunds or exchanges due to the nature and hygiene of the products. Also the following items are not refundable and can't accepts exchanges: All crochet dresses, crochet skirts, toys ,dolls . If you are not satisfied with any of my products I will issue a refund or exchange upon receiving the returned items. The shipping or return shipping charge is non refundable. The items should be returned within 7 days from the date of receiving them and they have to be in the original condition unused, unworn, unwashed and undamaged. Shipping in the U.S. with USPS priority mail and will include a delivery confirmation. Optional shipping insurance is available at additional cost of $2.95. Once the package leaves my possession the delivery of your item is out my control. I can't guarantee the shipping delivery date so the shipping dates shown are just estimates. Items sent Priority mail and Priority Express shipping the day of arrival is not guaranteed. Note to all International customers some packages are sometimes assessed customs and tax fees which is the responsibility of the buyer. Time of shipping depends of location but usually takes 5-7 days in US and international can take up to 2-3 weeks. Shipping to Australia will take up to 23 days.Shipping to New Zealand takes about 10-12 days. I also take custom orders. Please feel free to convo and I encourage you to please ask questions if unsure or want more specifications about the product before buying. Note : CUSTOM ORDERS: all custom orders are fully paid in advance. All details about orders are discussed individually prior to payment. The price for custom orders will vary and sometimes be higher than the price for the item listed in the shop due to variation of cost of yarn,or additional yards and selection of materials needed. The time making the product will vary with each order but usually takes 8-10 days . I believe in saving the environment and for eco friendly purposes I don't provide the receipts with the order. If you wish to have the receipt included please specify in the notes to seller.